Nonalcoholic steatohepatitis (NASH) is a form of nonalcoholic fatty liver disease (NAFLD) in which a person have hepatitis and inflammation of the liver, and can cause liver damage. NASH can lead to complications, such as cirrhosis and liver cancer. Patients with NASH have high chance of mortality due to liver-related causes such as liver failure. Lifestyle modification, including change in diet and exercise, is the basic therapy recommended for nonalcoholic fatty liver disease. However, in some cases lifestyle modification is difficult to achieve and to sustain, and therefore required other treatments including medicine. Currently available drugs for the treatment of NAFLD were historically been given for other indications. For instance, Orlistat, a gut lipase inhibitor, is indicated for decrease in the dietary fats absorption. According to the National Center for Biotechnology Information (NCBI) 2017 study, Orlistat has been approved for treatment of obesity and is available over the counter in the U.S. for weight loss. Orlistat-mediated weight loss is related with reduction in hepatic steatosis. 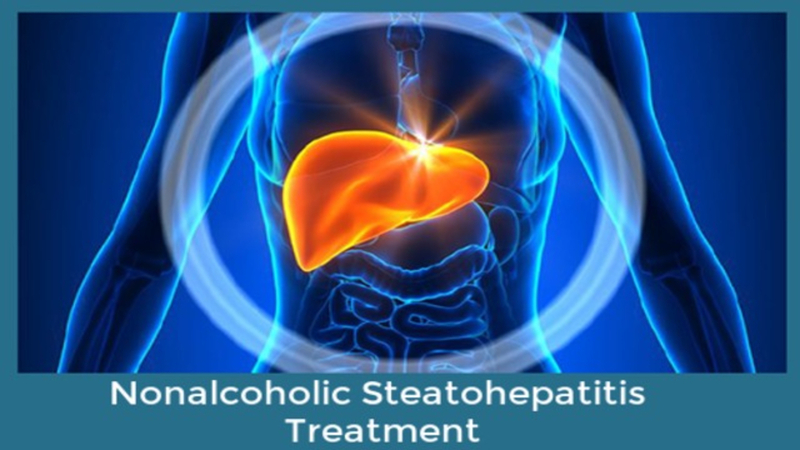 The global nonalcoholic steatohepatitis treatment market size was valued at US$ 1,119.9 million in 2017 (based on existing approved therapies anti-diabetics, vitamins, dietary supplements, and others) and is expected to witness a CAGR of 42.7% over the forecast period (2018 – 2026). Nonalcoholic steatohepatitis has become one of the most common liver-related health problems. The condition has been linked to an unhealthy diet and weight gain, but it can also be observed in non-obese individuals. Increasing prevalence of insulin resistance, and obesity is expected to fuel the nonalcoholic steatohepatitis treatment market during the forecast period. According to an article published in Lancet, globally, prevalence of overweight and obesity combined has risen by 27.5% for adults between 1980 and 2013. According to the National Health and Nutrition Examination Survey (NHANES) 2014 data, in U.S. the percentage of obesity is higher in women, i.e. 40%, than in men, 35%. Most therapies for NASH are in early- or mid-stage development and some are in late-stage studies. Multiple companies are focused on the development of drugs. In April 2018, AstraZeneca has licensed IONIS-AZ6-2.5-L, which has been renamed to AZD2693. The newly licensed drug is designed to inhibit an undisclosed target to treat patients with nonalcoholic steatohepatitis. In 2016 Bristol-Myers Squibb acquired rights for a NASH program from Osaka, Japan-based Nitto Denko Corporation. Despite the significant burden to the public health system, there are no FDA-approved specifically tailored drugs for nonalcoholic steatohepatitis treatment. Therefore, there is an immense need for effective treatment to manage the complex pathophysiologic processes of NASH. Numerous medications targeting different stages and molecular events in the disease process are currently in the pipeline, increasing the promise of successful treatment of NASH in the future. Key players operating in the global nonalcoholic steatohepatitis treatment market include AstraZeneca Plc., Conatus Pharmaceuticals, Enzo Biochem, Inc., GENFIT SA, Galmed Pharmaceuticals Ltd., Gilead Science, Immuron Ltd., Intercepts Pharmaceuticals, Novo Nordisk, Raptor Pharmaceutical Corporation, and Tobira Therapeutics, Inc.